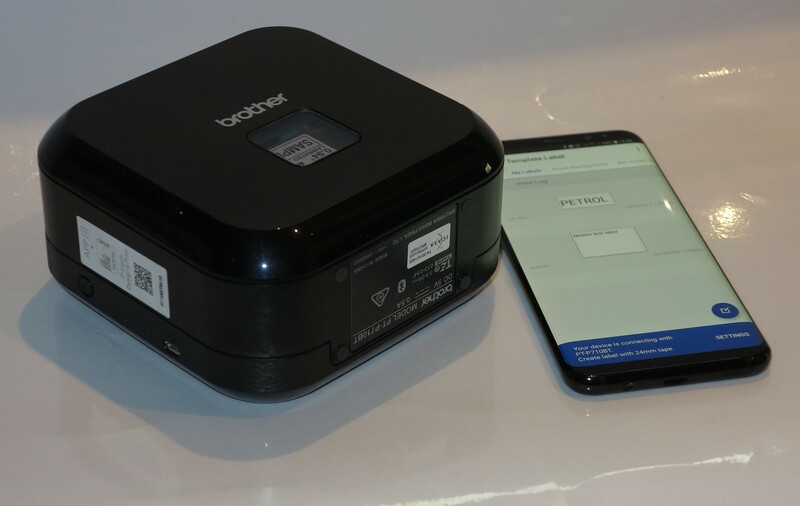 I am reviewing the Brother PT-P900W Wi-Fi-capable label printer which is the latest in the range of labellers based on Brother’s P-Touch thermal-print labelling system. This uses the same “drop-in” label-tape cassettes as the rest of the P-Touch labellers such as the TZe-261 wide white tape that came with this machine. There is a premium variant called the PT-P950NW which implements extra connectivity options. 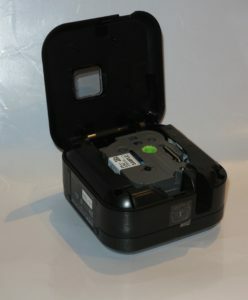 These come in the form of integrated Ethernet connectivity so you don’t need to use a Wi-Fi link to use it as a network label printer, USB host connectivity to work with USB-connected barcode scanners and similar devices along with the ability to work with an optional Bluetooth interface that only works with Bluetooth barcode scanners. Users can also purchase a rechargeable battery pack if they want to run it on battery power and this charges with the supplied AC adaptor. As well, you can also purchase a serial adaptor to work with input devices like scales or barcode scanners that implement traditional serial connections. But the piece de resistance that Brother puts forward is a touch-panel kit with LCD display that allows the machine to be purposed as a task-specific label writer. 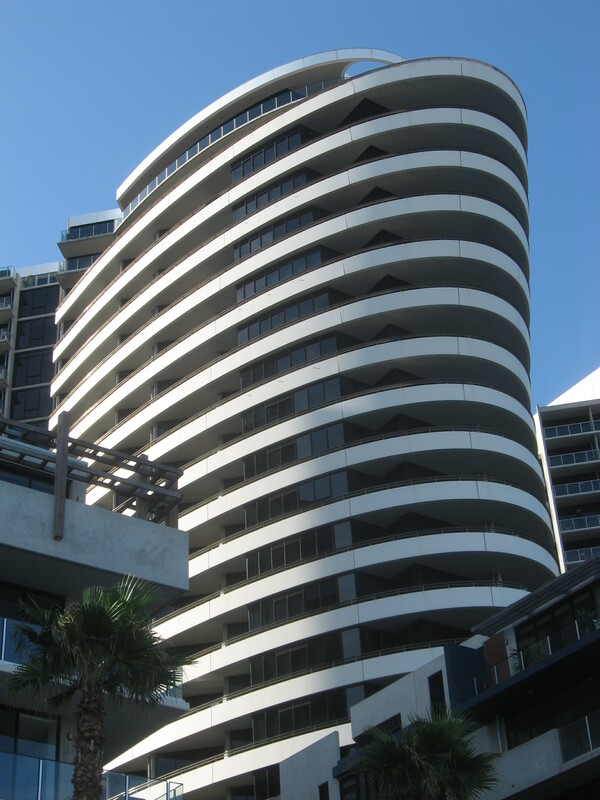 This includes the ability to work with pre-defined label templates or where you may have to enter numeric data. This unit is part of Brother’s P-Touch thermal labelling system which uses TZ-series label cassettes and came with the TZe-261 label cassette which had a wide writing space. 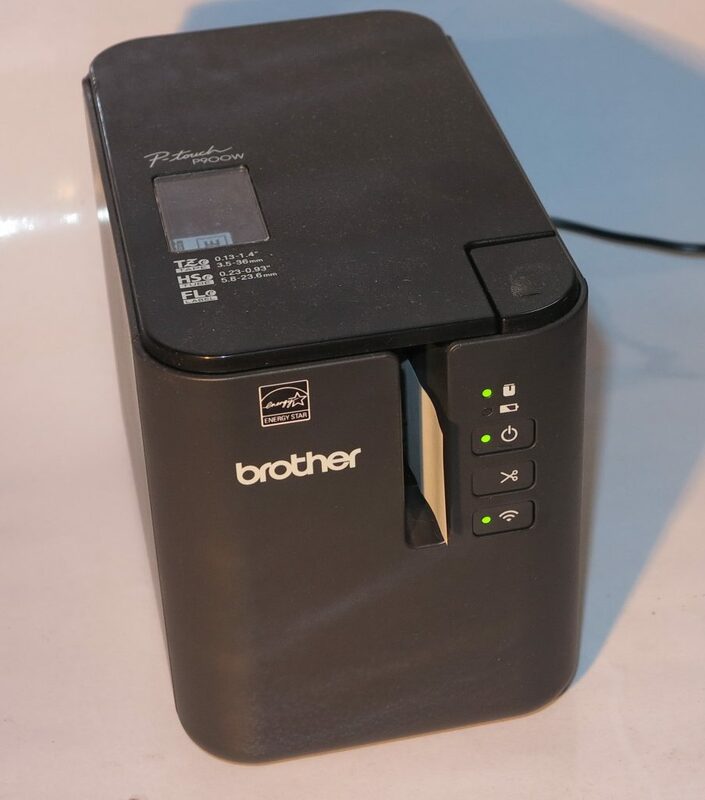 The Brother PT-P900 family of printers has a similar look to Brother’s latest business inkjet printers like the MFC-J5720DW inkjet multifunction thanks to the black housing with the rounded edges and flat top reminiscent of some 1950s-era home appliances. But it is easy to load and unload thanks to a lid that opens to reveal where the label cassette is. 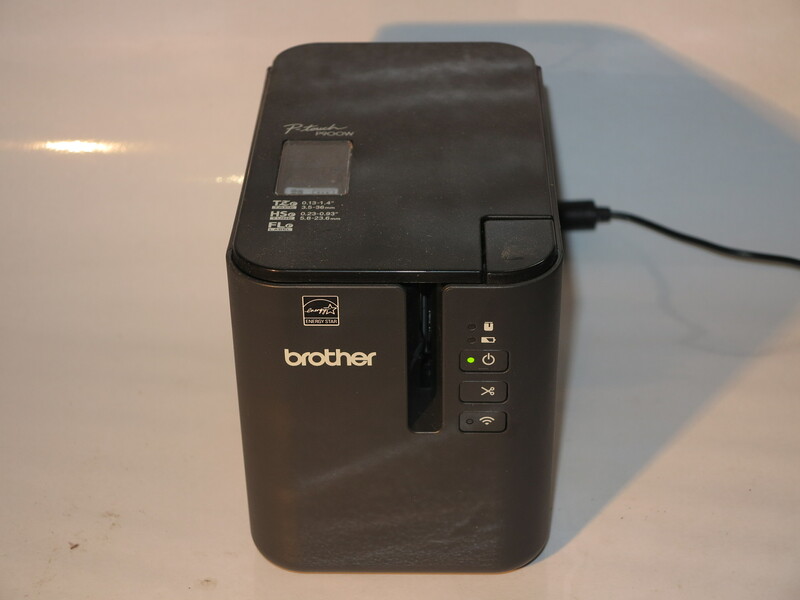 Previously, I ran the Brother PT-P900W as a printer connected to my computer and it has worked as expected with the software installing properly after I had downloaded it from Brother’s Website. It also was a chance for all the P-Touch Editor software that was on my computer to be updated, which would represent a situation if you have one or more other P-Touch labellers that are customarily hooked up to your computer or on your network. The Brother PT-P900W implements a highly-sophisticated network functionality for its Wi-Fi network. 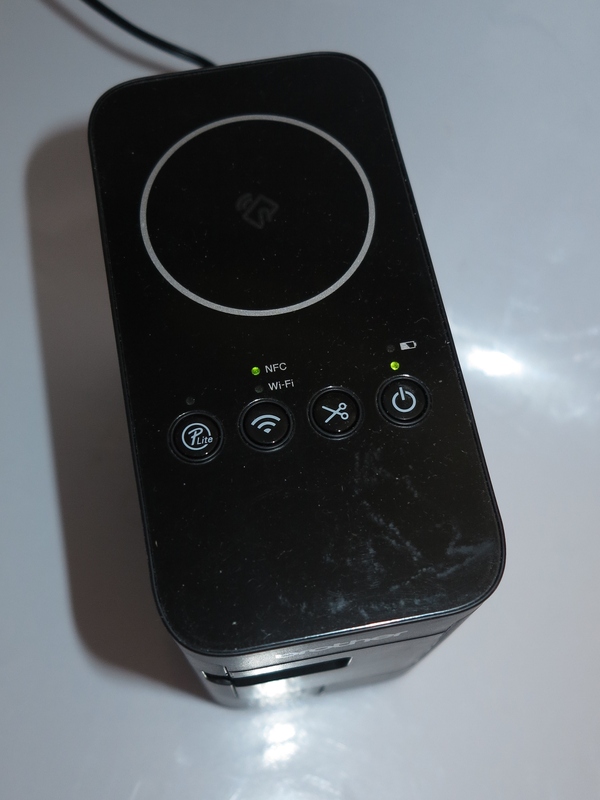 Here, it can work with 802.11g/n networks but needs you to set it up for a network that doesn’t implement WPS-based “push-to-setup” connectivity on its router or access point – thankfully most “Mi-Fi” portable Wi-FI routers can answer this call if you are setting up a mobile wireless network. This unit can also be set up to work with WPA2-Enterprise wireless-network segments found in larger businesses where there is individual user-based login to the network. But you may have to upload EAP-TLS certificates to the device from a regular computer. As well, it is future-proof in that it supports IPv6 in a dual-stack form. 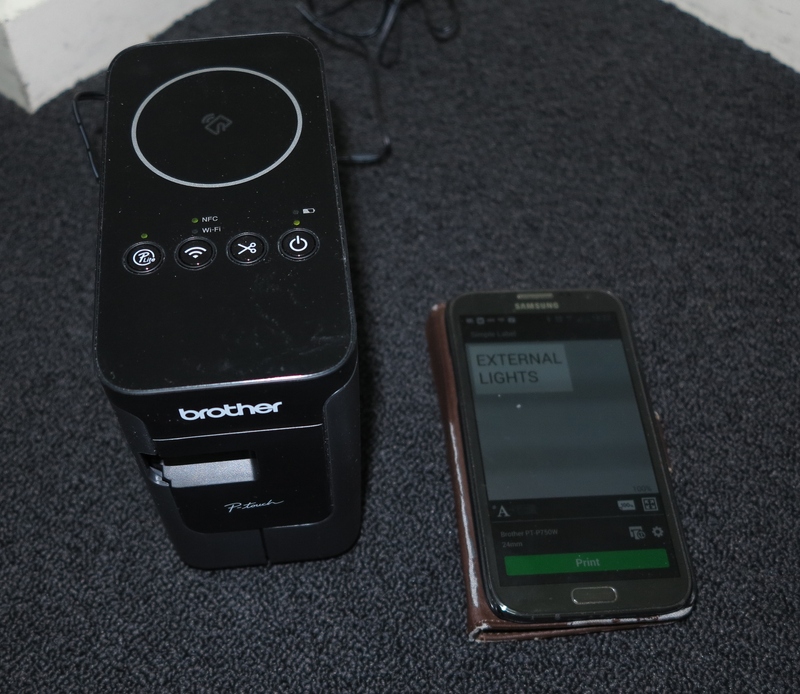 I set the Brother P-Touch PT-P900W label printer with my home network’s Wi-Fi segment and it worked properly, both with my phone connected to the home network and to the unit’s own Wireless Direct access point. The supplied Brother P-Touch Windows software is very flexible when it comes to printing needs and it can allow you to “gang” multiple Brother PT-P900W / PT-P950NW label printers with the same labelling tape for “round-robin” multiple-machine printing jobs. This can help with dealing with intense jobs like a stocktake or large delivery for example. As expected for devices based on the Brother P-Touch system, the output quality was very crisp and I had found that the TZe-261 label tape that came with the review unit could answer most labelling needs. This is more so if you, for example, make use of two lines for your labels. 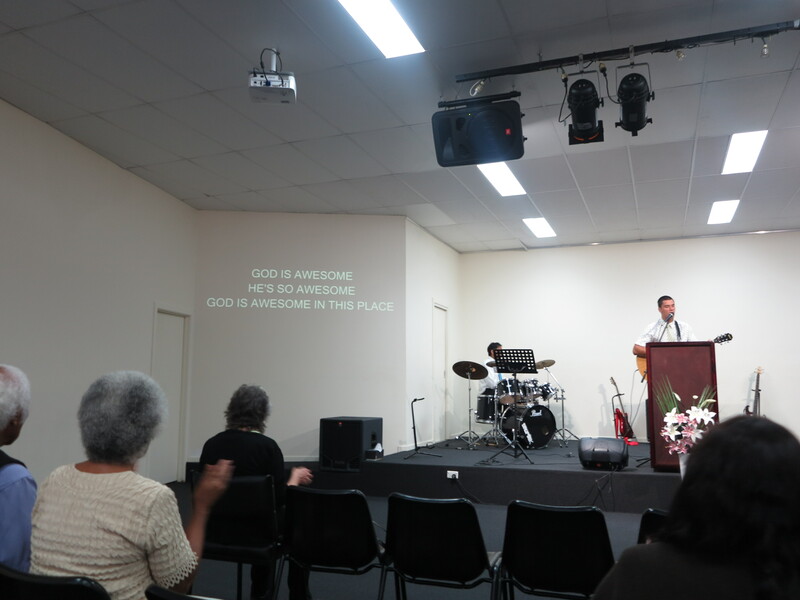 I brought the Brother P-Touch P900W label printer out to the church I worship God at in order to demonstrate it to a friend there who works as an electrician and obtain his opinion on this device. I used it along with my smartphone to turn out a label and he noticed that the machine turned out the label which he wanted to use on one of the mixing desk’s faders very quickly and clearly. It didn’t take long for the Brother labeller and my smartphone to set up together and I was able to have the label turned out very quickly. But he noticed that this machine looked a bit bulky and mentioned to me that he wouldn’t find it suitable for regular portable “on-the-go” use. He reckoned that it would work well for office-based applications and occasional transportable use. Personally, I would like to see a manual override between Wireless Direct and Wi-Fi infrastructure operating modes, which can come in handy if you want the unit to start quickly or to deal with difficult situations. Similarly, I would like to allow for mobile-based app-driven Wi-Fi setup similar to a lot of Wi-Fi-based wireless speakers and similar devices are set up. This is where you can have the opportunity to select Wireless Direct, connect your mobile device to the label writer’s Wireless Direct network, and use a mobile app to upload your infrastructure wireless-network segment’s parameters to the printer. The WPS “push-to-setup” functionality could also be extended to client-device setup so you can enrol your “open-frame” mobile device to the Brother labeller’s Wireless Direct network at the touch of a button. 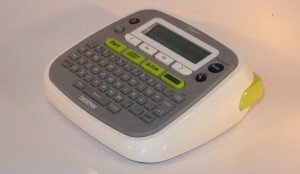 Personally, I would see the Brother P-Touch PT-P900W and PT-950NW label printers not as being for use on the road but as a tool for office-based workflow labelling with a regular computer or mobile device such as a smartphone, especially where the mobile device is likely to be used frequently as an input tool. Examples of this could be inventory control for the “reserves” at the back of a shop; or in a kitchen to keep control of foodstuffs and their expiry dates. 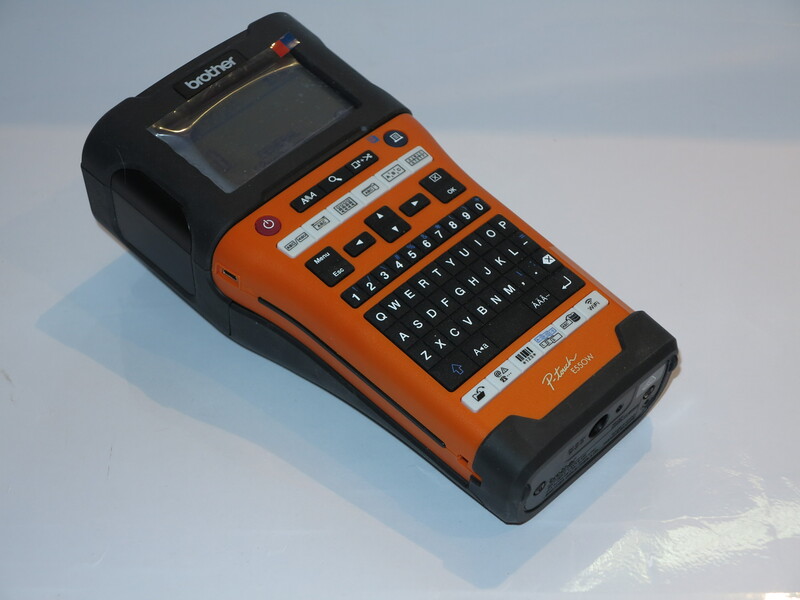 This is whereas the Brother P-Touch PT-E550WVP handheld heavy-duty label writer can earn its keep in the back of a tradesman’s van for on-site labelling. 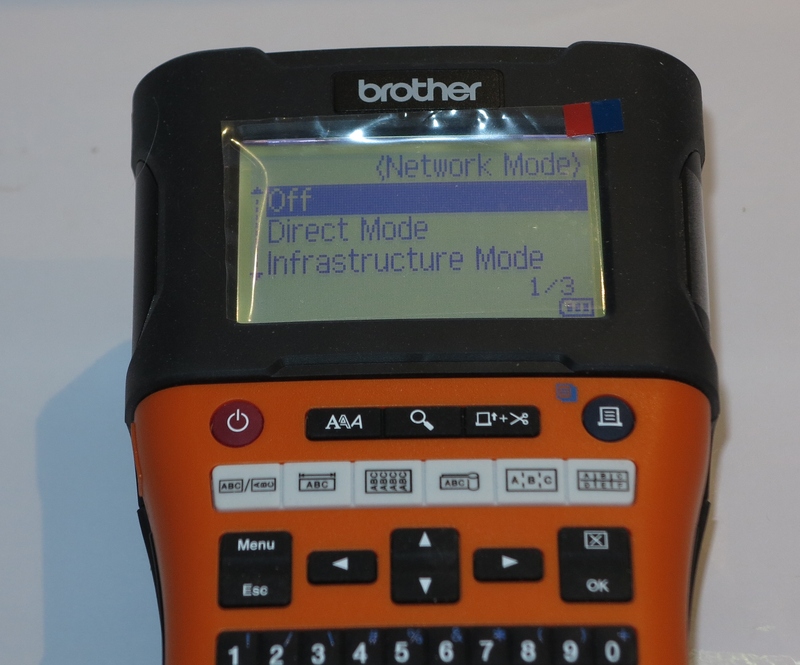 I am reviewing the Brother PT-E550WVP TZe-compliant handheld label writer which is pitched at electricians, AV and IT technicians and similar folk who work with different equipment. This ranges from those who work out of the back of their trucks or vans to the maintenance and IT departments of different workplaces. One feature that it has beyond the typical label writer is that it can work with other computer equipment via an existing Wi-Fi network segment or its own Wi-FI network. This allows for you to order labels on your smartphone or tablet and have it turn them out. The Brother PT-E550WVP label writer is a large handheld device which has a heavy-duty build and an orange-and-grey housing. 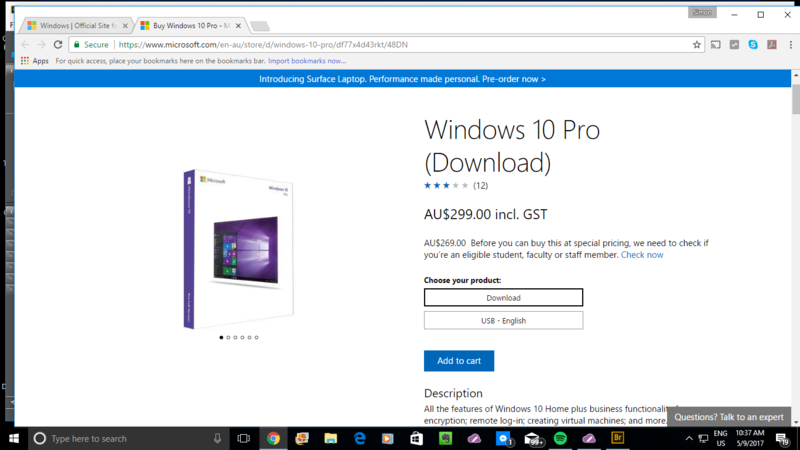 It is equipped with a large dot-matrix backlit LCD display that lights up when you are actually using the device, along with a rubberised keyboard. To load the batteries or label tapes in to this label writer, you have to remove the back cover from this unit by pressing a latch on the top edge. Here. 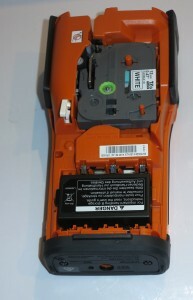 you have clearly-identified compartments at each end of the device for the batteries of the tape. It has what some people may describe as a “three-way” power supply arrangement where you can run it on mains power courtesy of a supplied AC adaptor/charger, a supplied rechargeable lithium-ion battery or 6 AA alkaline batteries of the Duracell kind. This means that even if you run out of power from the rechargeable battery while on the road, you can go to the convenience store and buy some batteries to complete that labelling project. Here, charging the unit’s lithium-ion battery pack is simple as plugging the unit in to mains power using the supplied AC adaptor. The Brother PT-E550WVP label writer is based on Brother’s TZe label-cassette platform which means that it can work with all of Brother’s TZe label products which suit different purposes. This includes their HSe series of heat-shrink label tubes that you use to attach to cables. This label writer has quick access to label templates that are optimised for labelling cables, patch-bays, outlets and the like which can make it an electrician’s or maintenance engineer’s best friend. As for on-device data entry, the large display makes it easy to see what you are typing in on the unit’s QWERTY-layout rubber-membrane keyboard. The disadvantage with this keyboard is that all the keys are “bunched-up” together rather than spaced out like a calculator’s keyboard. This can be awkward for some users, but you can at least feel which keys are which because each key on the main keyboard has a hemispheric “pimple” shape. The label writer doesn’t feel extra top-heavy while you are entering text and it still has that comfortable hand-held feel that is expected of this class of device. You have a dedicated accent key which can come in handy for entering the accents common in most of the Latin languages. This may also appeal to those of you who are learning foreign languages and use labels attached to items as a tool to reinforce your vocabulary. Here, you press the letter you want accented then press the accent key repeatedly until the desired accent appears. In the case of the “ß” used in the traditional German orthography, you type the S letter then press the accent key until the “ß” letter shows up. As for the output quality, the labels come out of this machine very crisp and clear as has been expected for Brother’s thermal labellers. You use the Menu and arrow keys to select the advanced functions like the network connectivity, cutting behaviour amongst other things. This leads me to the network connectivity which is one of its key features. 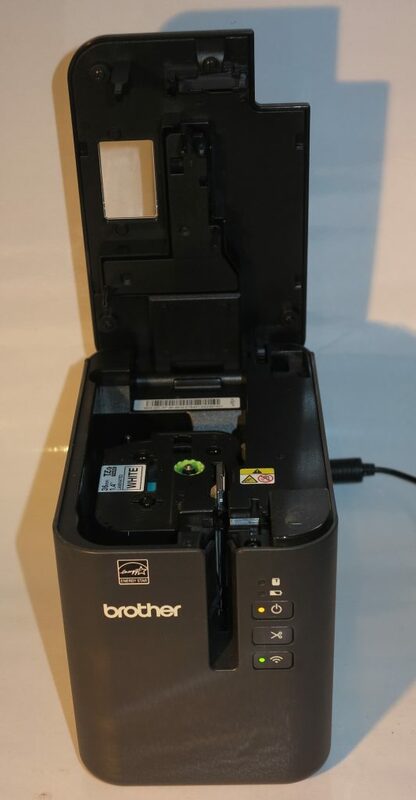 The Brother PT-E550WVP label writer can work as a label printer with a regular computer or a mobile device and can connect to the latter via Wi-Fi. This can be handy if you are wanting to run a batch of labels from your smartphone or tablet such as whenever you are out of the right label tape or you have left the label writer behind. Similarly, you can use this link to transfer databases or label templates created using the P-Touch software. 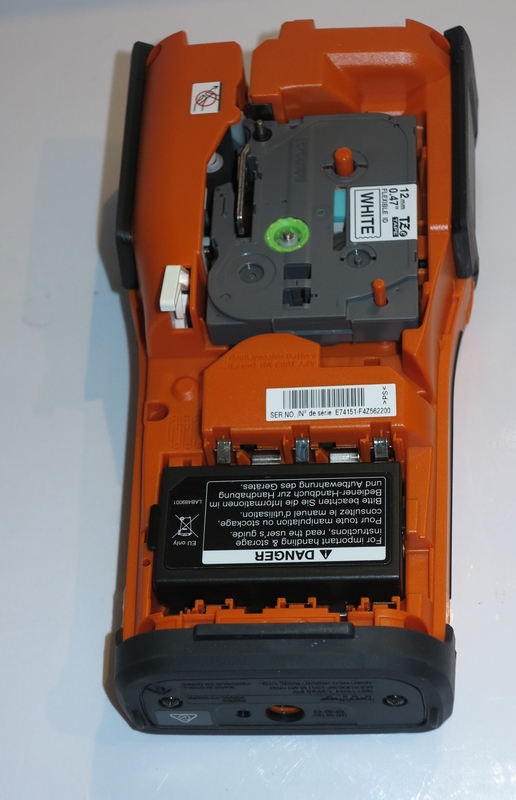 This model has answered a problem that was exhibited by Brother’s PT-P750W Wi-Fi label printer where it would attempt to connect to the last Wi-Fi wireless network it used before working as a standalone Wi-Fi wireless device. Here, the user has to select whether to run the label writer as its own Wi-Fi network or have it join an existing Wi-Fi network by using the WLAN menu option on PT-E550WVP’s menu and selecting “Direct” for working as its own network and “Infrastructure” for working with an existing Wi-Fi network. 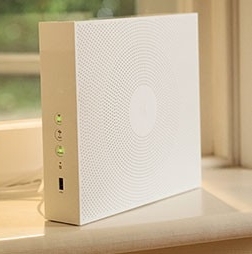 As for connecting via an existing Wi-Fi wireless network, you can connect this unit to Wi-Fi network segments that use WPS or classic WEP or WPA-Personal password setup methods. This typifies most Wi-Fi home or small-business networks but would preclude business networks that implement user-specific or device-specific authentication along with public hotspots that implement Web-based authentication. I showed the Brother PT-E550WVP label writer to a friend of mine who works as a maintenance electrician and let him have a play around with this device. He was impressed with this unit’s rugged design and ease of use. This was so much that he would suggest to his workplace to consider buying these labellers for the team he works with. 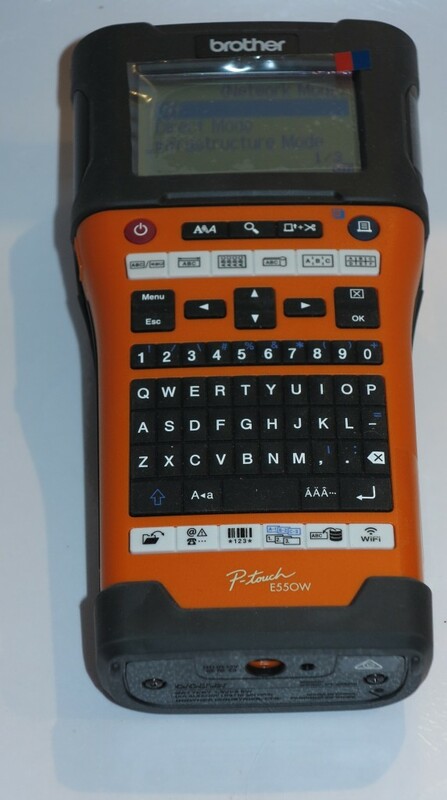 A feature that may be considered nice to have for the PT-E550WP would be to allow the label writer’s keyboard to serve as an external keyboard for a tablet or smartphone. Similarly, this labeller could benefit from an optional car adaptor so it can be charged up from the vehicle’s cigar-lighter socket when you are driving between jobs or want to conserve battery power when you work out of the back of your van. Similarly, Brother can improve on the display’s contrast to augment its useability. Here, they could implement display technologies like EL-backlit LCD displays or monochrome OLED displays which have a similar contrast to the vacuum-fluorescent displays but don’t consume as much power as those displays. A function that could come in handy for people who use this label writer as part of IT support would be to print out the SSID and, perhaps, the password of the current network. This may be useful for preparing a network-configuration card to give to the network’s owner or attach the SSID to the router or access point they have configured. 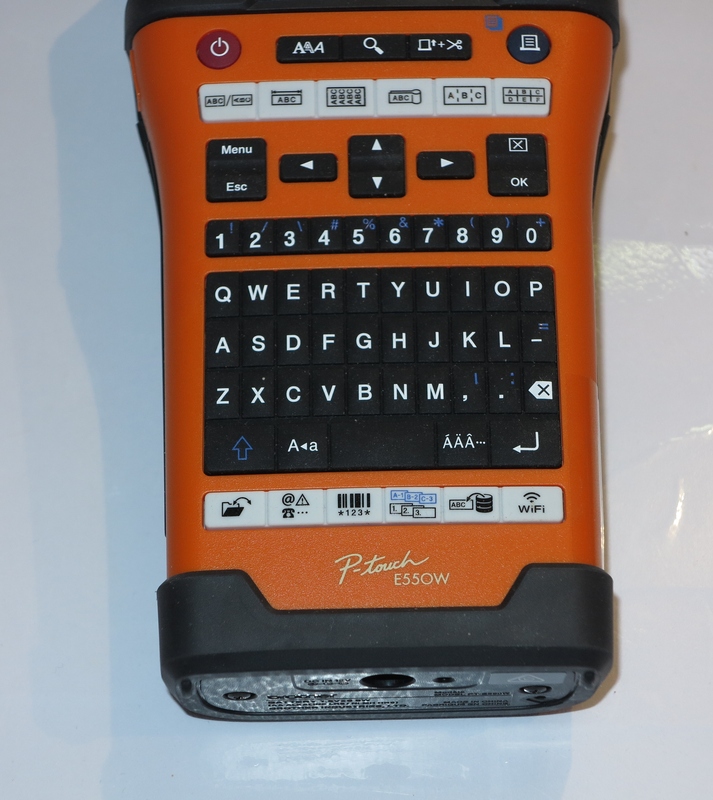 The Brother PT-E550WVP handheld label writer earns its keep for tradesmen and maintenance departments who value a highly-durable label writer and want to have the ability to link it with their portable computing equipment whether now or in the future. Personally, I would consider this label writer to be a viable tool for these kind of users rather than a toy. I am reviewing the Brother PT-P750W Wireless Label Printer which is the first portable label printer to be designed to work with smartphones and tablets.This is brought about using integrated Wi-Fi wireless network connectivity with Wireless-Direct (own access-point) operation along with the ability to work with a mobile-platform label printing app. 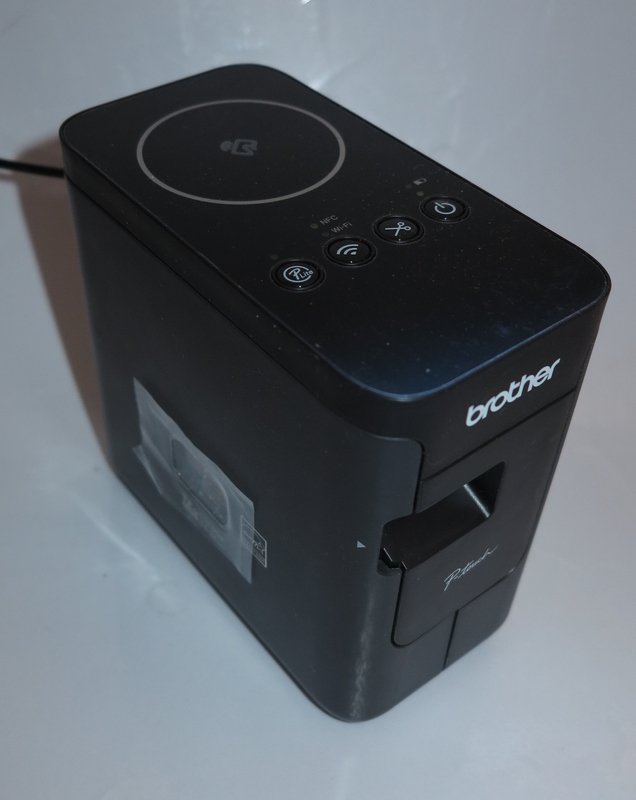 The Brother PT-P750W Wireless Label Printer has “three-way” power where it can work from AC power via a supplied AC adaptor, 6 AA batteries or an optional rechargeable battery pack. If you run it on the AA batteries, you can only connect to it using the USB cable which limits its printing abilities to laptop computers or tablets running the “regular” Windows or MacOS X operating systems. It uses the TZe series of P-Touch thermal label tapes which snap in to the Brother labeller in a manner not dissimilar to an audio cassette tape. Here, you have a wide variety of label tapes that can suit the different situations ranging from coloured labels through tamper-evident labels even to waterproof labels. 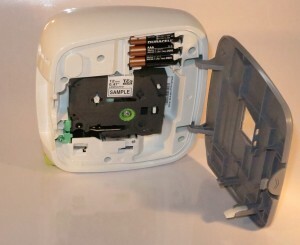 This machine can be connected directly to a regular computer via the USB cable or can be connected to regular computers or mobile computer devices via an existing Wi-Fi network segment or Wi-Fi Direct link. This includes the ability for Android phones that have an NFC connection and the Brither iPrint&Label app to “touch and go” for printing. As for the existing Wi-Fi segments, this can work with small networks that implement pre-shared key methods like WEP or WPA-PSK or can sign in to enterprise networks with a username and password. In these situations, if the network segment doesn’t implement WPS “push-to-connect” functionality, you have to use a regular computer running Brother’s “Printer Setting Tool” which you download from Brother’s Website and connect the printer to the computer via a USB cable to supply to the printer the parameters for the Wi-Fi segment you intend to have this printer work with. If you are printing from your smartphone or tablet, you would need to use the Brother iPrint&Label app to turn out the labels. This app worked well with my Samsung Android smartphone and it didn’t take long for me to link the smartphone up directly to this device and turn out a test label. 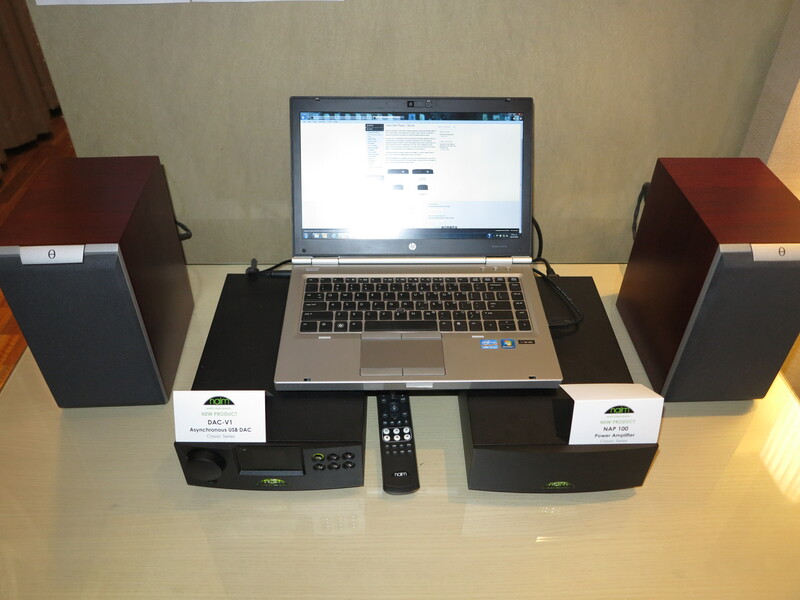 It worked very well with a clean easy-to-use interface that allows you to get the job done. Personally, I would have liked this app to support the ability for one to supply network connectivity information to the printer using that app’s interface as well as being able to print direct. Using a flashing Wi-Fi light to indicate Wireless Direct can have us think that something is going wrong even though the steady NFC light to indicate connection can lead to operator confusion. Rather, I would implement a dual-colour LED for the Wi-Fi light to indicate “infrastructure connection successful” in green and “Wireless Direct connection successful” in red or yellow. As well, have the light flash during connection establishment. The labels have come out of the Brother PT-P750W labeller very crisply and clearly even when I have used the iPrint&Label app. The app even implemented “right-sized” labelling to fit multiple-line text on the same piece of tape. I used this device at the church I attend to help one of the men who is a licensed electrician and does the AV and electrical work for that congregation to turn out a label for the external-lighting switch. Here, I found that the Brother PT-P750W “tries” for my home network and doesn’t immediately fall over to Wireless Direct behaviour every time it is powered up. Personally, I would like to have a switch on the unit that enforces Wireless-Direct as an operation mode there and then, in a similar way to some of the Pioneer wireless speakers that have a switch on the unit to enforce this mode, and this mode is highlighted by the Wi-Fi light changing to a different colour to indicate “independent” wireless-network operation. The man’s wife was intrigued by the way the Brother PT-P750W operates with a smartphone like his iPhone so as to make better use of that phone through the day. I had explained to the man how the device worked where he used his iPhone or iPad to label switches and outlets and he was even approaching me regarding how much it cost. An accessory that may be nice to have and may gain traction with this device’s target market would be a DC power adaptor. This would plug in to a vehicle’s cigar-lighter socket to allow this unit to be powered or charged from the vehicle’s 12-volt circuitry. Here it would earn its keep with those of us who work out of the back of a van by allowing us to charge the Brother label printer’s rechargeable battery while we are driving between jobs or locations, or have the unit working with the full wireless abilities and printing from our smartphones when we are preparing labels in the back of the van but without needing to have the optional rechargeable battery or compromising the battery’s runtime. 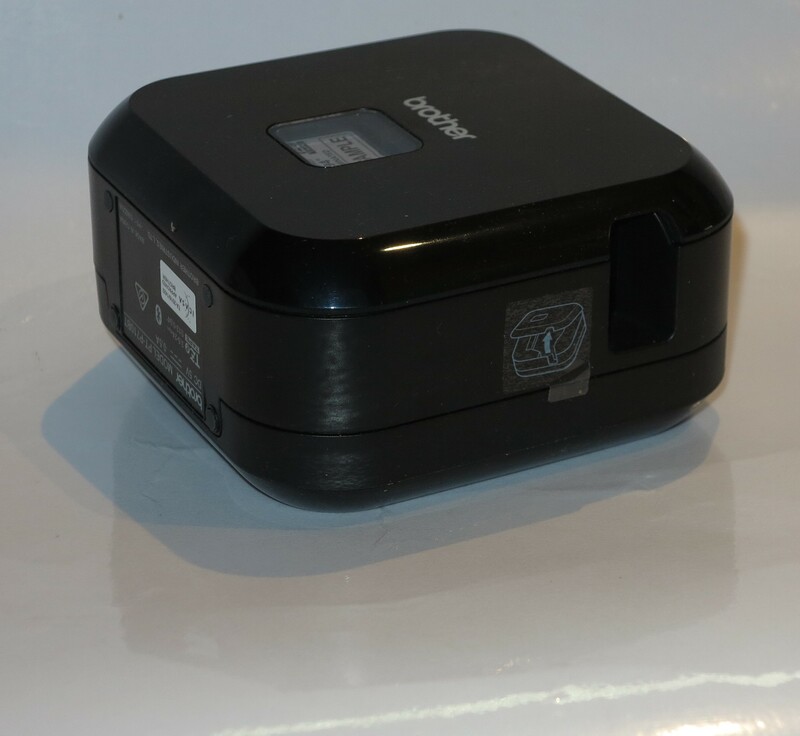 Another accessory that Brother could supply, whether “in the box” or as an optional extra, is a matching fitted carry-bag or road-case for this printer where the printer, its AC adaptor, a USB cable and a few label cassettes can be kept safely while it is taken “on the road”. Here, it also provides a single known place for the machine and these accessories so you don’t lose anything easily as you take it between locations. As I have said before. the Brother software could support the ability to use one of their labellers to create a calibrated measuring tape. This could come in handy when you want to make a surface become a reference for measuring an item’s length or height. I would pitch the Brother PT-P750W at electricians and other tradesmen along with maintenance departments who place value on using a smartphone or tablet to turn out labels as part of the job. 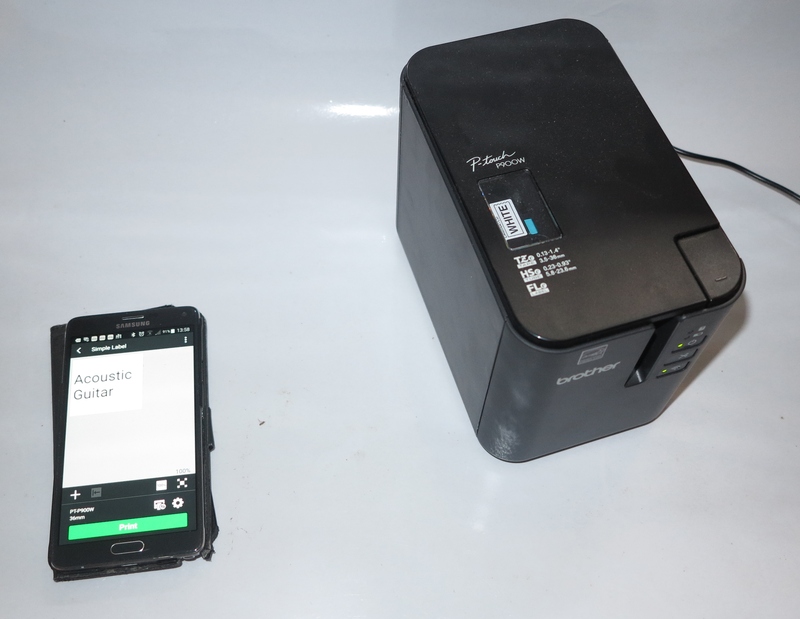 The fact that it can work as its own Wi-Fi wireless segment as well as working with an existing Wi-Fi wireless network increases its portability even more because you don’t have to pair your mobile device or this printer with an existing Wi-Fi wireless network. For that matter, I would see this machine as a viable tool rather than a toy. 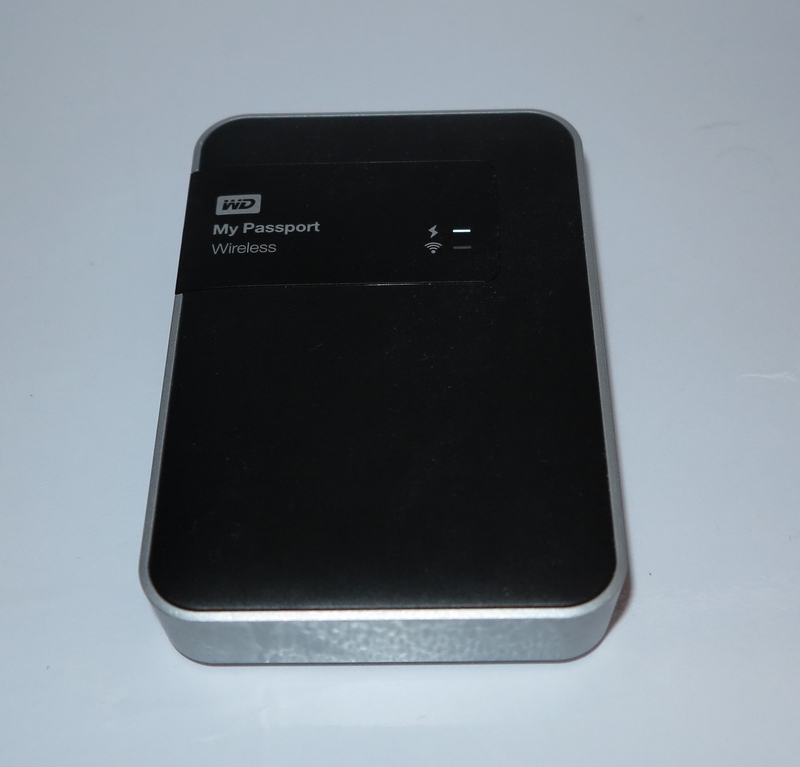 If you are intending to use the Brother PT-P750W Wireless Label Printer “on the road”, I would recommend that you purchase the rechargeable battery pack and have this set up for Wireless Direct exclusively for a truly portable setup with your mobile device. I am reviewing the Brother P-Touch PT-D200 Label Writer which is the newer “little brother” to the PT-2730 label writer that I previously reviewed. This one doesn’t have the computer connectivity that the PT-2730 has but can run on 3 AAA Duracell batteries. There is the opportunity to purchase an optional AC adaptor so you can run this unit off the mains although it didn’t come with one out of the box. 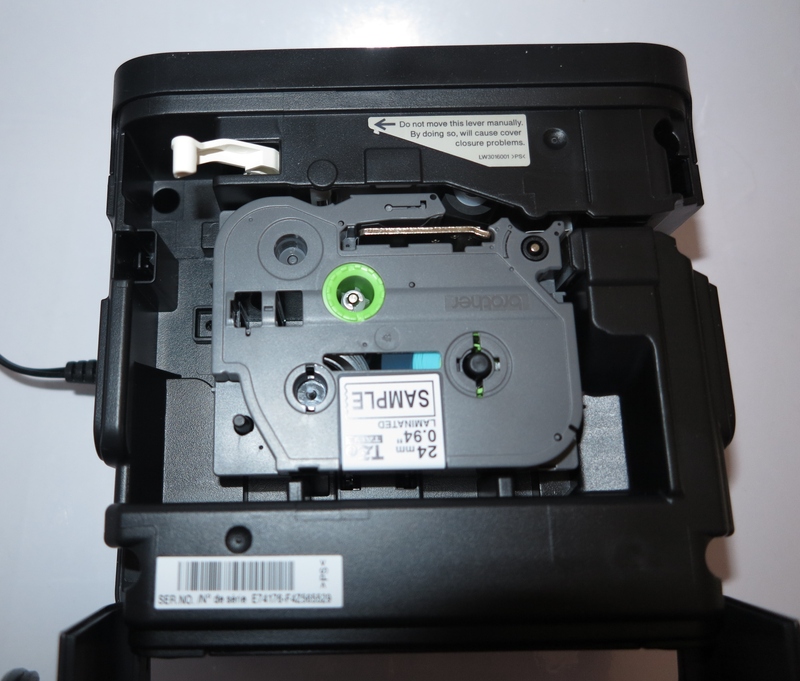 The Brother PT-D200 uses the new TZe labelling tapes which can also be used on the PT-2730 label writer. This can be handy if you want to maintain different label writers with different functionality levels but buy the same consumables. 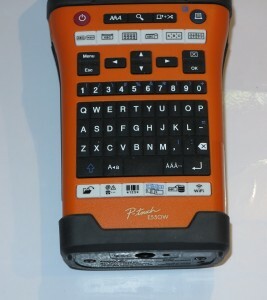 It has a large LCD display and a rubber-feel QWERTY keyboard for text entry. You even have the ACCENT key so you can create those “aide-memoire” labels that you attach to items for people learning a foreign language. But the display could be improved upon in contrast; as well as a WYSIWYG type of user interface for creating the labels. As far as the label-making procedure is concerned, it is the same, where you enter the text, then press “Print” to make the labels. Being a cheaper model, the Brother PT-D200 doesn’t connect to host computers like the PT-2730 does. This may not work well if you want to do anything beyond basic labelling. 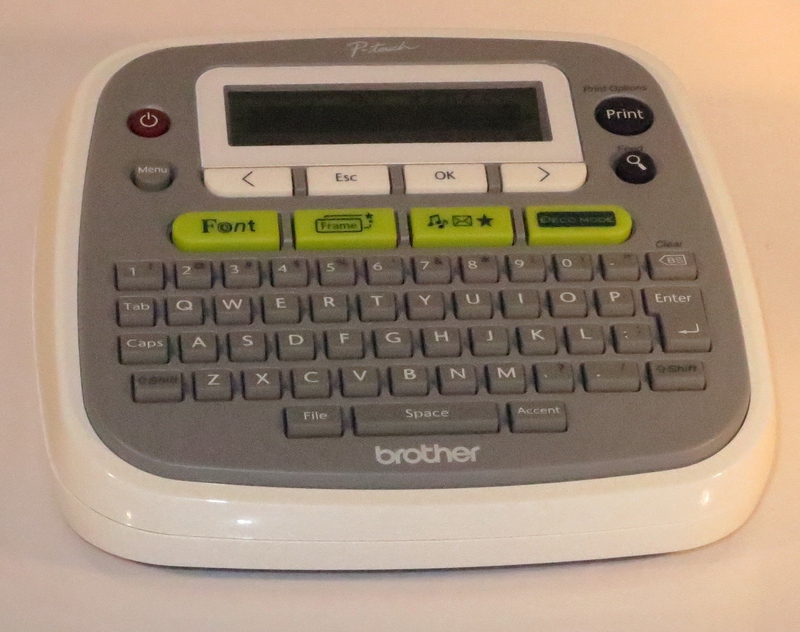 As I have said before, I would improve the Brother PT-D200 display and the display on other Brother P-Touch label writers by implementing a high-contrast appearance and display font. In some ways, this could also be achieved through the use of the monochrome OEL display which has the same contrast level as the fluorescent display commonly used with consumer-electronics equipment. 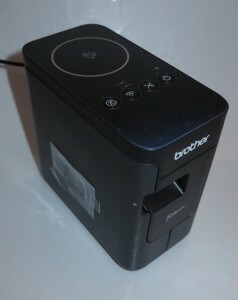 Another point of improvement is that Brother could provide for in-situ charging of batteries when connected to the optional AC adaptor. It is infact a practice that manufacturers like Canon and Sharp had done with some of their calculators which were capable of being powered from an external AC adaptor. This avoids the need to always remove the rechargeable batteries every time you need to charge them. I would recommend the Brother P-Touch PT-D200 label writer as a desktop-style entry-level labeller for those of us wanting to dabble with electronic label generation at home or in our small business. It would come in handy for people in charge of businesses or organisations who are using the Brother PT-2730 as the main label writer but want to have something that works as a battery-powered portable secondary unit.